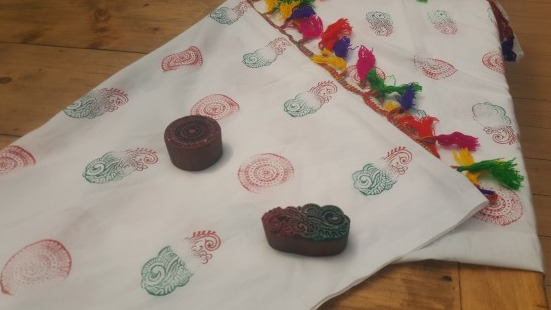 Block Printing Workshop by Hobby in a Box Come and create your own trendy colorful stole using Block Printing Technique,which is one of the oldest techniques of Textile Designing. In the workshop, each color pattern will be stamped individually onto the fabric. The slight human irregularities — inevitable in handwork — create the artistic effect symbolic of block prints. In this workshop, Participants will learn: - Selecting potential materials and tools - Applying art elements and creating patterns - Tips on composing your design - Optimum ink consistency - Hand printing techniques What will Participants take away: - Block printed trendy Stole - 3 Wooden blocks (Worth atleast Rs.600) - Food and Beverages Worth Rs.350 What to bring: Your creative bent of mind …. All the raw materials will be provided at the venue by Hobby in a Box. Share "Block Printing Workshop by Hobby in a Box"